Our goal is to deliver an ideas document that, when implemented, can respond to the challenges our working waterfront is facing. Forty-years after the establishment of the Office of Coastal Zone Management and the subsequent creation of Designated Port Areas, it is imperative that we reevaluate this framework and ensure that our policies and plans accurately reflect our priorities and continue to preserve and promote our water-dependent maritime industrial uses. The release of the City of Boston’s Resilient Boston Harbor plan highlights the importance of implementing resilient projects along Boston Harbor from the Neponset River to the Mystic River to the Belle Isle Marsh. The plan offers a vision for a resilient, accessible, and well-prepared waterfront. 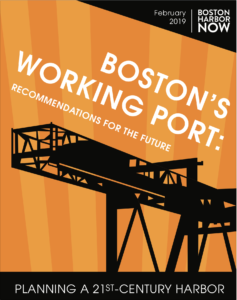 As a significant contributor to the economic health of our harbor, the working port must also prioritize executing a vision and implementing solutions that ensure the industrial waterfront is resilient in the face of rising seas. New Recreational Vessel Moorings Planned for the 2019 Season2019 Season Camping Reservations Opens!